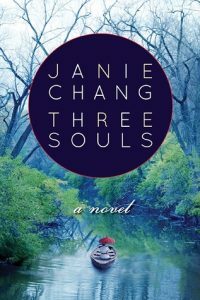 Leiyin learns she has three souls upon her death, souls who explain they are trapped with her ghost until she atones for some egregious transgression in her mortal life. They witness her, through memories, rebel against the patriarchal traditions of her father, suffer the consequences, and live with regrets for her naivety. In the early 20th century, Leiyin controls little about her life, and this during a civil war and Japanese aggression. Epiphanies hit her hard and fast reliving her memories. She must communicate with mortals to appease the gods by rescuing the fates of her loved ones in order to ascend to the afterlife with her souls. Chang’s blending and bending of Chinese culture and history create a compelling narrative of inadvertent espionage and acceptance of one’s place in society. The speculative elements placing Leiyin outside her own story fascinate the reader as they astonish Leiyin. Chang’s novels are educational in many ways, to the anticipated appreciation of readers of historical fiction, speculative fiction, and fans of Tatiana de Rosnay and Laura Spinella. Alice wakes from a daydream of the beach to a painful head in an unfamiliar gym, with a colleague peering down at her. She fell off her bike in spin class and misplaced the last decade in her brain. 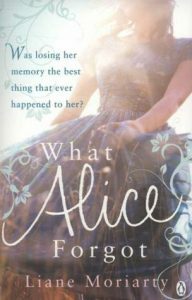 Current events are not so current, and Alice learns some astonishing facts about the world and popular culture. Over the following week, she discovers some harsh truths about that decade from family, friends, and neighbors. As she slowly gains insight into her own life and troubled relations with her loved ones, the soul searching begins. When the memories hit all at once, Alice is stunned and reasserts herself as she merges her 29-year-old self with her 39-year old self. Now this is how you open a novel! Moriarty begins the story with Alice floating in a pool, listening to a man playing Marco Polo with kids, knowing that the someone next to her with toenails painted different colors like her own is a person she loves. As the dreamlike sequence morphs into a painfully realistic nightmare of Alice’s confusion at finding herself in a gym, where she would never expect to be, the reader is pulled into the confusion and learns the truths as Alice learns them. Brilliant! Along with the facts presented to the memory-challenged Alice, secrets are unveiled, strengthening relationships and urging everyone forward toward positive opportunities. Readers who wish to be invested deeply in the main character’s life will love this book. If you are fond of secrets, humorous references to current (and not so current) events, and gut-wrenching situations, this book is for you. Moriarty will have you laughing and crying out loud!